standards. During periods of heavy drought, large cracks can form in the levees which are made of clay soils. Despite the catastrophic floods of recent memory, only a few years ago the entire State of Texas experienced a major drought that created this desiccation cracking in the FBCLID 2 levee embankment. The Emergency Levee Irrigation Pilot Project will field test portable irrigation equipment that can be deployed during the next drought. 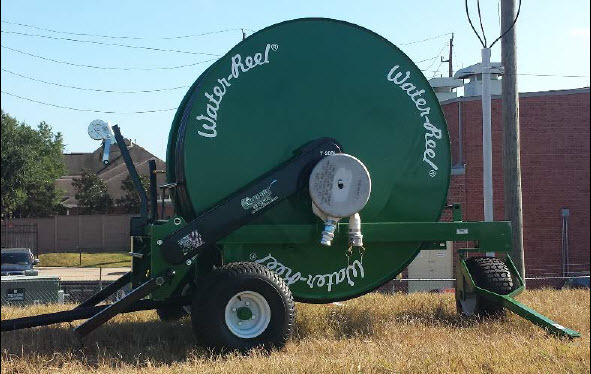 FBCLID 2 recently purchased the irrigation reel picture below which is fed by a portable pump that draws water from Oyster Creek. If the pilot project meets design expectations, FBCLID 2 will evaluate expanding the system so all levees can be watered in just 3 days. The Emergency Levee Irrigation Pilot Project is not intended to provide routine watering cycles throughout the year that are typically used in lawns or parks. The irrigation system would be specifically reserved for times of extreme drought to prevent any major cracking or damage to the levee. For questions or comments about the project email the FBCLID2 General Manger at gm1@fbclid2.com.